Last Christmas (2016) you couldn't move for those "3D Wire Frame Holographic" lights. The photos made it look like the image was projected out of a base. In reality you slotted a clear, flat plastic slab with the "3D" image into the base, which housed a light, that was supposed to give a 3D effect. I was given a Death Star variant as a present and while it didn't even remotely offer up a 3D image, I still really liked it as an ambient light. 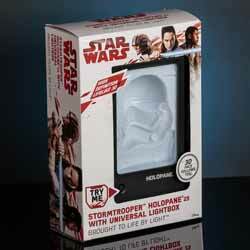 So, when I saw these Holopane 25 3D lightboxes, I was prepared to be conned once again. In fact, on opening the box my first fears seemed to have been well founded. The 3D effect is an optical illusion. 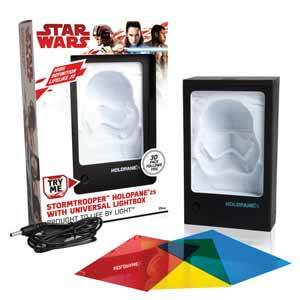 The lightbox houses the mould of a stormtrooper, but the mould is inside out, so you're looking at the hollowed out side. I switched the light on and I could still clearly see the image was inside out. It gave a sort of a 3D effect, but it was a bit naff. But when I put it down and moved some distance away (about 2ft) I suddenly saw how the effect was supposed to work. It fools your eye into seeing the stormtrooper the right way around and as you move your head, the stormtrooper moves too. In fact, if you lift it above your head you'll see the top of his head; move the lightbox down, so you're looking down on it, and you'll see under his chin. It's a neat effect and is really pretty cool. The pack comes with three transparent coloured films which you can place inside the lightbox in order to give the light a different colour. You get a red, blue and yellow film - and any school kid knows you can add two colours to get a third - so adding blue and yellow will give you a green light. The lightbox comes with three brightness levels. And you can also buy additional moulds of other characters. It has fixings at the back so that it can be wall mounted or free-standing, and it comes complete with a USB power cable, but can also be powered by 4 x AAA batteries. The unit is 16cm tall. Overall, it's a pretty cool gadget, and certainly the closest light we've seen so far that offers a 3D image.